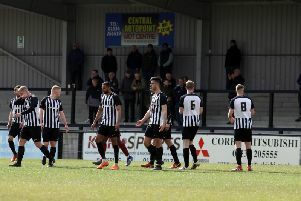 Andy Peaks was unable to hide his disappointing after AFC Rushden & Diamonds’ season started with a 1-0 defeat at Newcastle Town. Despite creating the better openings, Diamonds were hit by what boss Peaks described as a “sucker-punch” when Jake Lovatt headed home the game’s only goal with just two minutes left on the clock. It meant Diamonds’ new life in the Evo-Stik Northern Premier League Premier Division began on a low note. And Peaks was left to bemoan his team’s inability to take their opportunities. “It was very disappointing,” Peaks said. “We had most of the play but we didn’t take our chances and then we have been hit with a sucker-punch. “I learned a fair bit from the game but nothing we didn’t really expect. “I think we will come up against better teams in the future and that makes the fact that we haven’t taken our chances even more disappointing. Diamonds’ cause wasn’t helped by an injury to summer signing Jake Newman after the striker appeared to go over on his ankle just before half-time. But Peaks insisted that wasn’t the reason for the loss. “Jake is a bit sore and we will have to see how he is ahead of Tuesday (when Diamonds host Chasetown),” the manager added. “But him going off wasn’t the reason we lost the game.